Observers say Modi & Nitish have similar approaches to governance & their party colleagues, but couldn’t be more different in the contents of their campaigns. Patna: Prime Minister Narendra Modi and Bihar Chief Minister Nitish Kumar have a strange sort of chemistry. Political observers say the allies are rather alike when it comes to dealing with dissidence, cracking down on corruption and their hatred for interference from others. “But there can be no two leaders who are so far apart when it comes to raising issues during elections,” a senior leader from Nitish’s party Janata Dal (United). So far on the campaign trail for the Lok Sabha elections, Modi has held three election meetings in Bihar, and Nitish has shared the dais with him at two of them — in Gaya and Bhagalpur. And the stark contrast has been there for all to see — while Modi has stuck to a national security and hardline Hindutva narrative, Nitish has mostly spoken about the work he has done in his 13 years in power. In Bhagalpur, the site of one of the worst communal riots in the history of independent India in 1989, Modi spoke a bit about his government’s welfare schemes, but a substantial portion of his speech centred around the Balakot air strikes. “Ghar mein ghus ke maara hai (I have beaten them up in their own home),” he said to a cheering crowd, stressing that there was “fear” on the faces of the Pakistani leaders and their “sponsored” terrorists. He asked the crowd if the special powers of the Army should be withdrawn. “I have arrested those in Jammu and Kashmir who were being funded by Pakistan. The opposition says they will hold talks with the extremists. Can you trust such persons?” he asked. The rest of his 15-minute speech was about the development work done by both the state and central governments, and the efforts made to uplift the poor. “I would like to thank the PM for helping Bihar. In just the road sector, the Centre has given Bihar Rs 50,000 crore. He has started a metro rail project, and taken steps to restart the fertliser factory in Barauni,” Nitish said, insisting that if voters want Bihar to prosper, they must ensure Modi is given a second term. At the Gaya rally too, while Modi mocked the Congress’ “discovery” of the term ‘Hindu terror’ and stressed that Hindus could never engage in terror, Nitish stuck to development. “I am asking for my labour charge, for the work I have done in the last 13 years,” he says at virtually every election meeting. There is also a sharp difference in the way Modi and Nitish attack their political rivals. The PM calls them “mahamilawat”, corrupt and sympathetic to extremists. Nitish, meanwhile, hardly even mentions the opposition, at most taking mild jibes. “There is power connection in every household in Bihar. The age of the lantern (electoral symbol of the RJD) in Bihar is over,” he said at one meeting. “Never ever has Nitish made below-the-belt remarks about the opposition. Modi believes in humiliating them. Even when Nitish was a political rival of Modi, he never made personal attacks,” said a JD(U) MLC. This newfound complementariness is a far cry from Nitish’s complicated history with Modi. Between 2005, when the JD(U)-BJP combine came to power, and 2013, when Nitish quit the NDA protesting the elevation of Modi as PM candidate, there was an unwritten ban on the Gujarat CM’s entry into Bihar because of Nitish’s wariness of Modi’s role in the 2002 communal violence. Not even BJP leaders dared to utter Modi’s name in their public speeches in Bihar. In 2010, when Modi came to Patna to attend the BJP’s National Executive meet, the relationship between the BJP and the JD(U) almost reached breaking point, with Nitish cancelling the dinner he was supposed to host for his allies. It’s even more ironic that they couldn’t stand each other because they seem so alike, said a JD(U) leader. “They are so alike — neither faces any corruption charges, both are workaholic, both are ruthless when it comes to dealing with dissent and neither promotes dynasties,” the leader said, adding that this is probably why Nitish found the ‘mahagathbandhan’ with Lalu Prasad unworkable. When the JD(U) and the BJP rekindled their alliance in 2017, it was believed that Nitish would have to play second fiddle. But he has stuck to his guns that he will not tolerate “three Cs — corruption, crime and communalism”. “He dealt with efforts to engineer communal strife during Ram Navmi last year with an iron fist, and did not allow a communal flare-up. In these elections, he ensured that the JD(U) is fighting on an equal number of seats 17, when the expectation was that the party would get single digit seats. 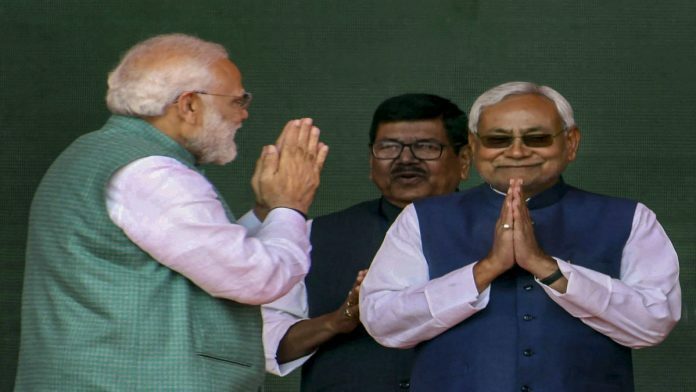 Nitish Kumar is asking the people of Bihar to vote for Narendra Modi for the first time, but he has dictated his terms to the BJP,” said a senior JD(U) leader.